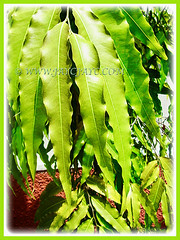 The False Ashoka or Indian Mast Tree is a remarkable and majestic columnar tree. Besides, it exhibits a beautiful symmetrical pyramid-like crown with willowy weeping pendulous branches. Its very attractive new golden and coppery brown leaves against old dark-green leaves makes a spectacular show. Botanical Name: Polyalthia longifolia (syn. : Guatteria longgifolia, Unona longifolia, Uvaria longifolia). 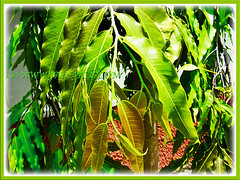 Common Name: False Ashoka, Buddha Tree, Mast Tree, Indian/Weeping Mast Tree. Etymology: The genus Polyalthia is derived from a combination of Greek words, meaning many cures with reference to the medicinal properties of the tree. The specific epithet longifolia is in Latin, referring to the length of its leaves. Origin: Native to India and Sri Lanka. 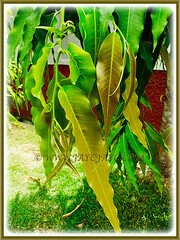 Plant type: A tropical, ornamental and perennial tree. Features: Polyalthia longifolia is from the genus Polyalthia that consists of over 100 species of flowering plants and shrubs. 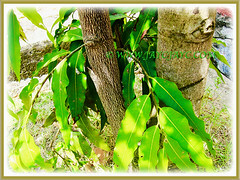 Polyalthia longifolia is a slow-growing tree that can reach between 10-20 meter tall. A lofty evergreen tree that is much taller than broad. Its woody trunk has dark grey bark and exhibits symmetrical pyramid-like crown with willowy weeping pendulous branches. This evergreen, tall and slender tree produces fresh and shining green foliage. The lanceolate leaves are long and narrow with undulating margins. Leaves measuring 22 cm long and 4.3 cm wide are arranged alternately along the stems with a short 5-10 mm petiole. The entire height of the tree is covered by its dark green foliage. Fresh leaves are a coppery brown color and are soft and delicate to touch. As the leaves grow older the colour becomes a light green and finally a dark green. The beautiful contrast of new golden and coppery brown leaves against old dark-green leaves makes a spectacular show. During flowering which is once annually, the tree will be covered with bisexual and star-shaped flowers in pale green. 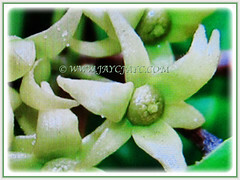 Each flower has five narrowly triangular, star-like, yellow-green petals. The flowers are inconspicuous and non-scented, measuring between 3.5-4.5 cm. The flowers last for a short period, usually two to three weeks. They are arranged in pendulous umbels. Eventually, the flowers will be followed by egg-shaped and fleshy fruits that are borne in clusters of 10-20 and contain a single seed. 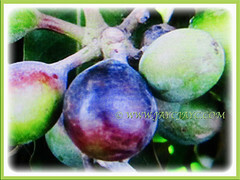 Initially they are green but turning purple or black when ripe. Culture (Care): Polyalthia longifolia or Indian Mast Tree can be grown easily with least maintenance. Soil: Rich, loamy and well-drained soils. However, it is adaptable to a wide range of soil types. Others: The Indian Mast Tree requires no pruning at all as its natural shape is a big part of its beauty. 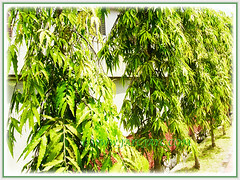 Nevertheless, if allowed to grow naturally without trimming the branches with its plentiful leaves, it can provide a very good shade. Feed three times annually with a top quality granular fertiliser. Generally, it is free from serious diseases and pests. It may be susceptible to die-back disease caused by a species of Phomopsis. Polyalthia longifolia or False Ashoka can be grown in subtropical regions with a minimum temperature of 0°C. At least cold hardy to -1°C for a short time. A majestic tree that is intolerant to cold weather. It grows naturally in sub-humid to humid subtropical regions in frost-free areas with annual lows of 15-25°C and annual highs of 26-34°C. Feed three times a year in spring, summer and autumn with a top quality granular fertiliser. It flowers from spring to early fall. Propagation: Easily propagated from seeds that remain viable only for a short time. Most seeds will germinate within two to three weeks. Usage: Polyalthia longifolia or Mast Tree with its majestic columnar and architectural accent will be excellent as a roadside tree, tall hedge and privacy screen tree. An ornamental tree that is most suitable for landscapes, as visual dividers, noise pollution screen or wind blockers. 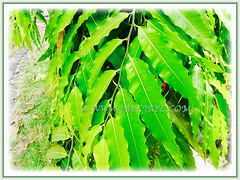 The leaves are used for ornamental decoration during festivals. Its tall, straight and light-weight trunks are used to make masts for sailing ships. Hence, it is commonly known as the Mast Tree. Both the trunk and the bark are used in manufacturing of fiber. Timber is used for making boxes, pencils and long masts. Leaf extracts have anti-bacterial and anti-fungal properties. 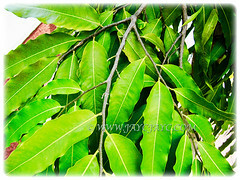 Bark used in Ayurverdic medicine to treat fever, diabetes, hypertension and intestinal worms. In India and Sri Lanka, its leaves are used in religious ceremonies and for decorating arches and doorways. The ripened fruits are loved by birds such as the Asian Koel, bats and flying foxes. The leaves are larval food plant of the Tailed Jay butterflies. A magnet to attract birds and butterflies.